Before going for a holiday, it is a must for my friend and I to purge the refrigerator and the pantry to make sure there won’t be any mouldy or smelly surprises waiting for us when we return home. There were times when we would pass each other groceries that we couldn’t finish (the beauty of staying only 5-minute walk away) so that they don’t end up in the bin – and these bananas are one of them. 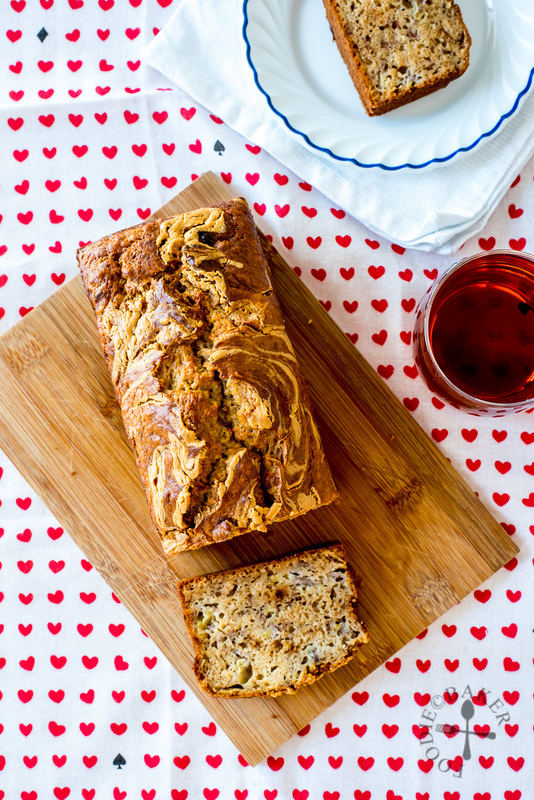 As I only eat bananas on their own on holidays before a hike, these bananas naturally went into another baking attempt for banana loaf – this time round with a peanut butter surprise! 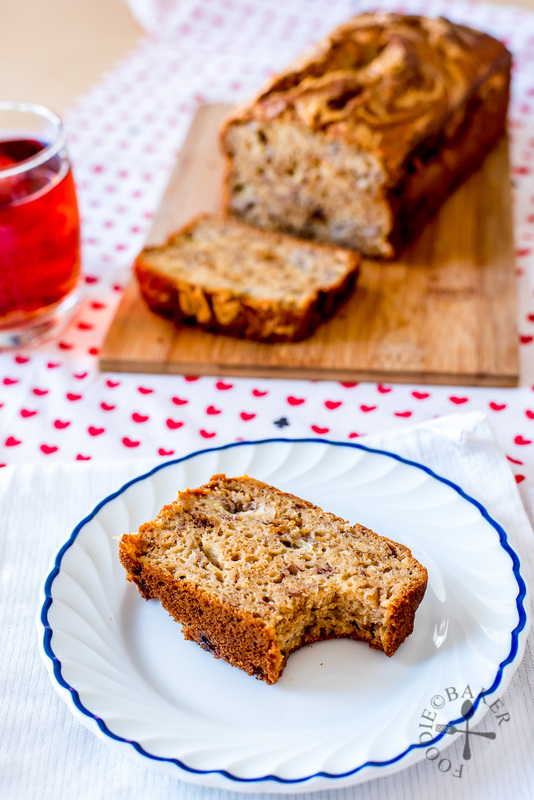 I used one of my old banana loaf recipes but made it simpler – instead of creaming the butter with sugar, I melted the butter and whisked it with the wet ingredients, sugar and mashed bananas. They were then added into the bowl of dry ingredients and folded until just combined, and that’s it, the batter is now ready! Peanut butter is then swirled into the batter before baking. 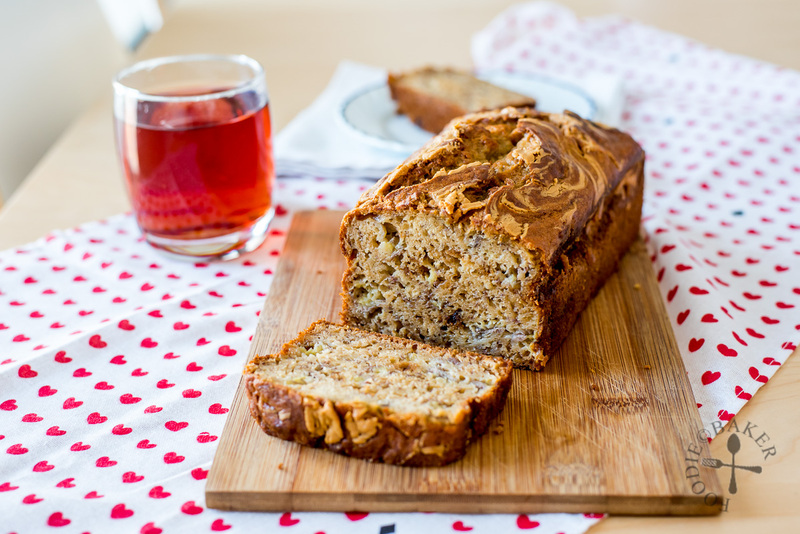 The banana loaf rose high with a nice crack in the middle, giving the loaf a rustic look. I think the dark brown sugar also helped gave the loaf the deep brown colour that I love. 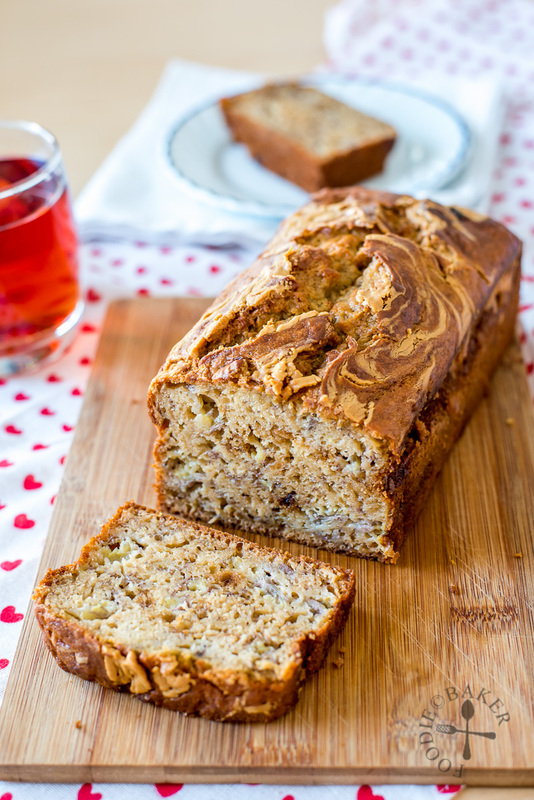 In terms of taste, the loaf is extremely moist and chock full of banana flavours. The amount of peanut butter I used is not so much until there’s peanut flavour in every bite, instead they are like little peanut surprises! I believe Nutella will work equally well here too. Preheat the oven to 175C/350F. Butter an 8x4-inch loaf pan (I used 8x3.5-inch) and line the bottom with parchment paper. Set aside. Whisk flour, baking soda, baking powder and salt in a large mixing bowl. In a 2-cup measuring cup, whisk together melted butter, buttermilk and eggs. Whisk in the brown sugar, followed by the mashed bananas. Pour the wet ingredients into the dry ingredients. Fold with a large wooden spoon or spatula until just combined (until no flecks of flour is visible). Scrape ½ of the batter into the prepared loaf tin and spread it evenly with a spatula or the back of a spoon. Drizzle ½ o the peanut butter onto the batter and swirl with a knife or skewer. Scrape the remaining batter into the tin spread it evenly. Drizzle with the remaining peanut butter and swirl it again. Bake for 45 to 60 minutes until a skewer inserted into the center of the loaf comes out clean. (Check the loaf frequently after 30 minutes, if the top is getting overly browned, tent it with a piece of aluminium foil.) Let the loaf cool completely in the tin on a wire rack. - Use overripe bananas - they are easier to mash, sweeter and more aromatic. - If you don't have buttermilk, you can: 1) Combine 75 grams milk and 5 grams vinegar. Let sit for 10 minutes and stir before using. 2) Use 40 grams plain yogurt and 40 grams milk. - Natural peanut butter contains at least 90% peanuts with no artificial sweeteners, colours or preservatives. You can use creamy peanut butter if you don't have natural peanut butter. Microwave the creamy peanut butter at 30-second intervals so that the peanut butter becomes runny, making it easier to drizzle. - Instead of peanut butter, use Nutella instead! I am drooling, I love banana bread in all it’s glorious forms. I am loving the PB swirl.